This is a piece I wrote some time ago on the subject of getting my son to school. In my mind, this is a fundamental illustration of why segregated cycling facilities have to be the future. He is now nearly 6, and the problem remains. 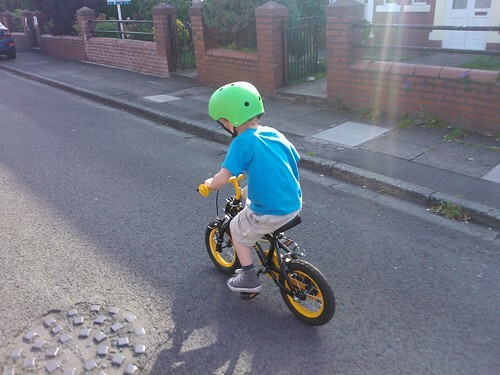 A few weeks ago, I was delighted to be able to tweet a message that my 4 yr old son had successfully negotiated one of life's more memorable milestones - he had made his first solo flight on his little black and yellow bike; stabiliser free and wind in his hair. What a little belter. He has since practised hard, and has subsequently added "the launch" to his skill set, plus some pretty advanced cornering abilities. I've even raised the seat as he's grown. If he could only master stopping (he keeps forgetting where the brakes are) we'd be sorted. No doubt he'll get it eventually. This is a brilliant development, and just in time for mum and dad, as he has outgrown the rear bike seat he used to use on his mum's bike. He is also starting to get too big for the IT Chair on my Brompton; or at least he's getting too heavy for my feeble pedalling efforts to actually propel us forward. But, despite our pride in his achievements, and pleasure at his progress, we do have a problem. What do we do next? I mean, he's only 4. He lacks any understanding of the rules of the road. He's a bit wobbly too - it's only been a few weeks after all since he got the hang of it. How can he develop and utilise this new ability? Why not ride to school? Fortunately for us, we thought, his new primary school is accessed via a back lane and is only about 250m from our back gate with only a few side road crossings to negotiate. Excellent, we thought - we could fit a Trail Gator to our bikes, allowing us to tow him to school behind us on his bike and as his confidence grows maybe he could start to do it on his own after a few months. Problem No.1: No cycle parking at the school, preventing us from unhitching him and continuing our journey unencumbered. Not very welcoming, and no special parking place for a little one on a bike. Ok, so perhaps we could just lock up his bike just off school premises and carry on regardless? Problem No.2: The back lanes we were relying on as a safe route become a mess of traffic, both parking and speeding through, for 30mins before school starts and for 30mins after it finishes thanks to the school run rat-runners. I prefer walking when it's like that, so it's not really a place for a little one on a bike. Ok, but we are lucky to have a place for the little feller at the breakfast club and the after-hours club, allowing us to get him to school early and pick him up late and thus miss the rush. Sadly, at these times the lanes are used as rat runs by commuters who are able to zoom through when the gridlock of the school run is not present - I've been chased in the past at full tilt by the odd car who has bullied past despite the lack of room. So perhaps not the ideal place for a little one on a bike. So where exactly is the place for a little one on a bike in this world? After all, acquiring a new and important life skill should be cause for celebration, not dismay. It shouldn't be "if only". I have a confession to make. Since I got interested in all things related to cycling infrastructure and road design, I find myself all excited when my monthly email update arrives from SWOV, the Dutch Institute for Road Safety Research. This is why the bloody Internet does to you and it is a disgrace. Anyway...this particular paper caught my attention for being a bit chameleon like. It is both interesting and informative, whilst also having a whiff of The Daily Mash about it. The basic premise seems to be a bit radical for these shores, so I'm glad no self respecting UK highway engineers would be caught dead reading it. Those Dutch traffic boffins claim that the speed vehicles travel at along a section of road directly affects both the number of accidents that will happen there AND their severity. After that mind altering revelation, they go on to make the heroic suggestion that in order to achieve a desired speed limit on a road, you need to design the road environment accordingly. I presume, in my typically naive and unqualified way, that means going little bit further that just sticking up a speed limit sign and hoping that the moral fibre of passing drivers is sufficiently robust. I like the SWOV papers not just for their earnest (and thus faintly amusing) air. More importantly, they demonstrate an enthusiasm for modern, updated and continuous research into road safety measures. They are not afraid to test ideas they themselves once promoted and to note where they fall short in practice. They cover all road users. This body of knowledge helps policy makers take decisions on the basis of study, and does not simply rely on the endlessly regurgitated, and hopelessly outdated, publications of yesteryear which seem to underpin the equivalent in this country. I do hope that something similar exists here. Note that this has been in my pending tray for almost a year, such is the lack of blogging I now manage to indulge in. Oops.